The O.J. 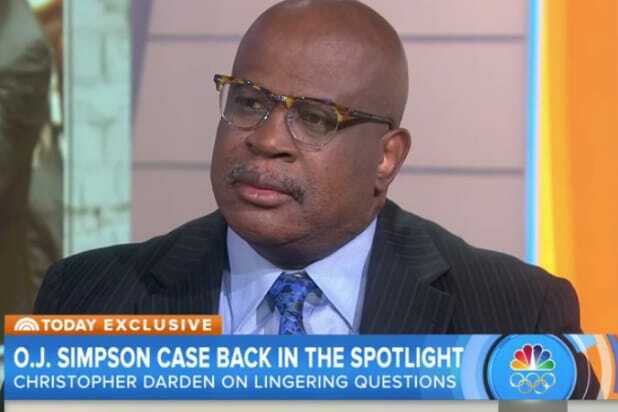 Simpson murder case is more than 20 years old, but prosecutor Christopher Darden is still getting new tips. During a taping of the “Reasonable Doubt” podcast with Adam Carolla and Mark Geragos, Darden said that just days ago he heard from a woman who says she saw Simpson near his ex-wife Nicole Brown’s house on June 12, 1994, the night she and Ron Goldman were killed. The comments were aired as a snippet on Tuesday’s “Adam Carolla Show” podcast. The full “Reasonable Doubt” episode will post on Saturday. Darden was part of the Los Angeles County District Attorney’s Office team that lost its case to Simpson’s so-called “Dream Tream” when Simpson was acquitted in the double murder of his ex-wife and Goldman. Any witnesses who come forward now will be no help to Darden — Simpson can’t be tried again because of double jeopardy laws. He has been making the media rounds lately because of FX’s “The People v OJ Simpson” and ESPN’s documentary “OJ: Made in America” The first dramatized the trial, and the second looks back at Simpson’s life before, after and during the case.